The Piano Maker could have been so much less, and in that way, been so much more. I thought that the author, who has written five novels before this one, would have been experienced enough to have realized the benefits of a simple structure focused on a primary theme. But in stead, there are too many themes that do not seem properly integrated, resulting in a melodramatic tone. The title, The Piano Maker, seems to be an afterthought rather than a sustained theme, while in actual fact, the history of pianos and their makers is fascinating – as I found out when I researched the provenance of my own piano. There are parallel themes of art theft and smuggling, war, workplace safety, even palaeontology, French Indochina, France at the end of the 19th century, the French in Africa, and quite a lot of religion (religious music, liturgy, priesthood, etc.) The main idea is probably “survival” or “closure” or the redeeming value of confession, and the fact that I cannot pinpoint exactly what the point is, is the problem. The plot is this: “Hélène Giroux” grows up in France, the daughter of the owners of a firm, “Molnar”, that produces hand-crafted pianos – hence the book title. She gets involved with a man who robs her blind in the first world war, and – despite this – ends up as his partner, “appropriating” cultural treasures from all over the world. En route to appropriating another valuable artefact, this time a dinosaur skeleton from Northern Alberta, something happens (spoiler avoidance!) and she is arrested. In 1933, she lands up in a small, fictional town in Nova Scotia, Canada, Saint Homais. She goes to work as the pianist in the local church and is soon discovered by the police on the basis of fresh evidence – and the drama unfolds. Her past life is told in flashbacks from her new life in Saint Homais. As a mystery it is so-so – the case hinges on a small point of law. 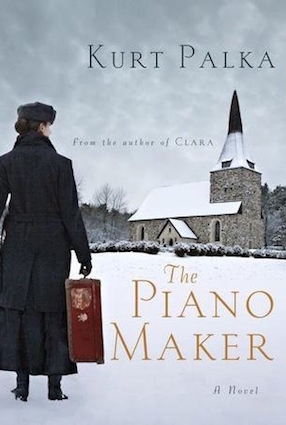 As a historical novel on the piano-making industry, it is all right but could have been so much more. Perhaps the author, who credits an “old-world accordeur” (tuner) with introducing him to the world of pianos, simply could not get sufficiently into the subject of piano-making to have depicted more of it. It is after all, a particularly arcane industry, and unless you are an artist writing about their art, like soprano Vivien Shotwell writing about opera in Vienna Nocturne, writing with true insight and depth would be a tall order. Thankfully, the parts about music and pianos – mostly the first half of the book – are acceptable, like Palka’s description of the kinds of wood that pianos are made of, and the process for Hélène to become a certified piano maker. Palka frequently mentions the popular religious music of the time. He writes that she plays Morning Has Broken in the church. (p.89) Not the Cat Stevens version, obviously; the song only became known as Morning Has Broken when it originally appeared in the second edition of Songs of Praise (1931), to the Scottish tune Bunessan, and with lyrics by English author Eleanor Farjeon. So barely two years after being published in England, Hélène is performing it in Nova Scotia, Canada. Mmmm – so soon? Exceptionally efficient international distribution of sheet music I would say. In the Bleak Midwinter was written by Christina Rossetti before 1872 and posthumously published. It became a Christmas carol after it appeared in The English Hymnal in 1906 with a setting by Gustav Holst (the melody is called Cranham), and Harold Darke also set it to music in 1911, and since then everyone from the King’s Singers to Susan Boyle have recorded it. The words are simple, and no doubt Holst or Darke would’ve made the most of them and added as many frills and furbelows as the lyrics could stand. I cannot see how anyone, especially an amateur, could’ve taken the song and “expanded it into a circular ballad”. A circular ballad? What is that in any case? With its simple couplet rhyme scheme the poem is not a ballad, nor a rondeau, nor a roundel. So much for it being circular. And as for making it something different, Darke had already set it to music and varied the melody from verse to verse – from slow and pompous to dramatic and sentimental. In another incident, where the music (and not necessarily the piano) is the highlight, she plays ’Twas in the Moon of Wintertime, a.k.a., The Huron Carol, a Canadian Christmas hymn (Canada’s oldest Christmas song), written probably in 1642 by Jean de Brébeuf, a Jesuit missionary at Sainte-Marie among the Hurons in Canada. Brébeuf wrote the lyrics in the native language of the Huron/Wendat people; the song’s original Huron title is Jesous Ahatonhia (“Jesus, he is born”). The song’s melody is based on a traditional French folk song, Une Jeune Pucell (“A Young Maid”). The well-known English lyrics were written in 1926 by Jesse Edgar Middleton. If only books could be played, you could’ve had this sweet yet somber hymn running through your head while reading about Hélène coaching the church choir. Tackling this novel meant that Palka had big shoes to fill. Even though it is differentiated by the fact that it is partially set in Canada in the early 1900s, the fact remains that readers could have – would have – compared it to novels on a similar theme by other authors. I remembered all the very good novels I’ve read where piano players and tuners were core themes and the plot and characters almost purely focused on pianos and music: The Piano Tuner (Daniel Mason, 2002), The Piano (Jane Campion and Kate Pullinger, 1995), The Piano Teacher (Janice Y.K. Lee, 2009), infamously, The Piano Teacher (German: “Die Klavierspielerin”, by Austrian Nobel Prize winner Elfriede Jelinek, 1983), and more recently and perhaps not as focused, Vienna Nocturne (Vivien Shotwell, 2014). No doubt, the subject of pianos and those that make them, play them, tune them and teach them, is wide and fascinating and inherently dramatic. For instance, there is the weird – but apparently true – story about how in 2000 a grand piano was brought from London and got dragged through the rain forest of Guyana, to a small, remote village of the Wai Wai people, re-assembled, played, retuned and eventually lost to the elements. The film about this incident, by Dr. Michael Gilkes, is called Concert in the Rainforest (2002). In terms of a Künstlerromane which expertly portray both the artist and the medium, a pianist and her piano, there are Virginia Woolf’s The Voyage Out (1915) and The String Quartet (1921). Could it have been a Künstlerroman? By most definitions of the genre, this book is not fit. But novels in this genre is as much about the instruments or mediums of the artists as about the artists themselves. It’s about the paints and canvases of painters, the pianos of composers and pianists, the clay and metals of sculptors – and how, through these, and their own lives, the creators connect with the world. In my mind making a piano, giving it a voice, a tone, a timbre, making it sing, making it possible to be played – that is a creative process. Even though it is a mass process, it is no more mass manufacture than say, Jeff Koons producing signed copies of his own works. Each piano is about as unique as the next one, though it is made in the same way by the same master craftsman. Here is Woolf’s descriptions of the first few notes of the musical performance in her short story, The String Quartet, where the music is described in visual terms, like a landscape. A practical problem: How to depict music in words? “The choice of musical themes such as the depiction of musicians or instruments was a long-standing tradition in painting before tone painting — which found expression even in literature, in numerous Künstlerromane — came to be propagated more forcefully as of the eighteenth century. Under the influence of musical aesthetics, musical art became something of a role model for painting in the nineteenth century and, subsequently, structural principles were transferred gradually to the production of visual imagery, as illustrated by Philipp Otto Runge’s Die Zeiten (The Times of the Day; 1807). So, it’s not impossible – it’s just difficult. It takes skill and applying the metaphors, analogies, concepts and idioms of art, for instance, to descriptions of music. But Edmund de Waal did it quite successfully in The White Road, where he effectively compares porcelain objects to music. As I said, there are numerous themes; piano manufacture, ancient artifacts, war(s), workplace safety, nursing, even palaeontology, French Indochina, France at the end of the 19th century, the French in Africa, and quite a lot of religion. So much going on that it is difficult to find the book’s focus. I identified the climax but could not find a link between music, piano-making and that moment or in the book’s conclusion. The first half of the book is about her life in France as a piano maker – which is not bad – but then the events in her life after France are about many things other than the manufacturing of pianos. The conclusion seemed to be about repentance and forgiveness. Again, I wondered what that had to do with the price of eggs. I guess I wanted too much from this novel. It is just a historical romance, well-researched, with interesting detail, no anachronisms that I could pick up, with a twist of romance and mystery, competently written. Perhaps the fault lies with the publisher for allowing that title in the first place. Some instruments are marvels, others merely something for children to practice playing on. And some pianos, like mine, are loved and valued merely because its sound is the sound of my childhood and all other pianos do not sound quite right by comparison. This could’ve been the novel’s theme throughout. But like a poem which does not quite become what the writer or reader had in mind, the novel also falls short of expectations with this reader.